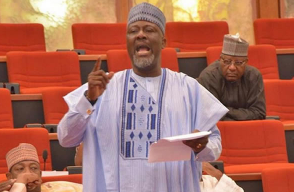 Following yesterday's attack on a member of the Kogi state House of Assembly, Senator Dino Melaye, has called on the acting president, Yemi Osinbajo, to declare a state of emergency in Kogi state as the state might soon be thrown into Anarchy. "The draconian Idi Amin approach to governance by Yahaya Bello today as displayed by his criminally minded hooligans and hired killers in usurping the legislative powers and priviledges of the paliament is a clear manifestation of satanism. The unwarranted attack on Hon. Friday Sani Makama shall not be swept under the carpet. We are not in a banana republic. It is manifestly clear now that the acting President must declare a state of Emergency in Kogi State before Anarchy becomes Total. The economic cankerworm and social scavenger called Bello must be tamed before he finishes spending the little political capital left for APC in Kogi. We must not all keep quiet and allow this Stranger destroy the labour of genuine APC members in Kogi. We will not allow him to take us back to Egypt. We must rescue Kogi NOW!!!!. - Dino Melaye".